This property sold for $137,000 over 1 year ago. GREAT OPPORTUNITY TO LIVE IN DESIRABLE SUFFOLK SECTION OF CENTURY VILLAGE, A 55 AND BETTER COMMUNITY! AMENITIES INCLUDE A STATE OF THE ART BROADWAY STYLE THEATRE OFFERING GREAT ENTERTAINMENT AND LIVE SHOWS, AMAZING CLUBHOUSE, GYM, POOLS, BILLIARDS, TENNIS, GOLF AND MORE. A COURTESY BUS PROVIDES TRANSPORTATION TO AMENITIES AND DESTINATIONS IN THE LOCAL AREA. THERE IS A CONVENIENCE STORE ON THE PREMISESWHERE YOU CAN GET A CUP OF COFFEE, ICE CREAM, SNACKS, OR JUST MEET YOUR NEIGHBORS! THE 4TH FLOOR CONDO FEATURES UPGRADED KITCHEN AND BATHS, ALL TILE FLOORS, EAT IN KITCHEN, WASHER AND DRYER IN THE UNIT AND A SCREENED IN BALCONY. 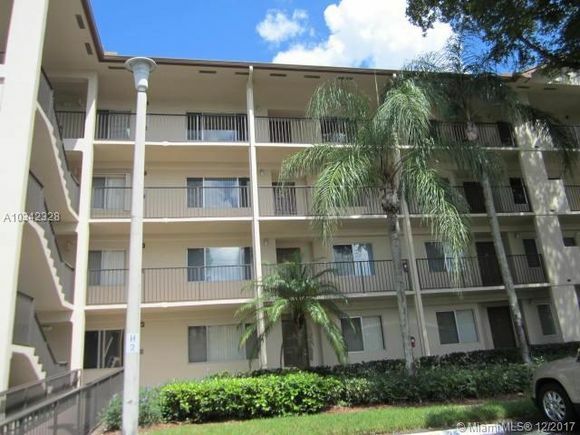 LOCATED IN THE HEART OF PEMBROKE PINES CONVENIENT TO GREAT SHOPPING, RESTAURANTS, AIRPORTS. NO PETS PERMITTED. SERVICE ANIMALS ALLOWED WITH PROPER DOCUMENTATION. PINES BLVD TO SOUTH ON 136TH TO MAIN ENTRANCE. AFTER GATE TAKE A RIGHT AT THE STOP SIGN AND THEN TAKE A LEFT AND FOLLOW SIGNS TO SUFFOLK BLDG "H". PARK IN GUEST PARKING.